4 7 f e e t l o n g a n d c l e a n ! Pool Update. The official 2003 opening was celebrated (with chianti, pasta, and a ritual video split-edit). 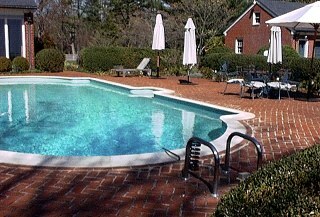 We've enjoyed the pool and patio throughout 2002 with friends and clients. Plan now to join us for a project and a swim in 2003.